Open almost any pregnancy book on the shelf these days and you will find an entire chapter or more devoted to discussing what women should eat when they are expecting. As a new mother myself, I would know. 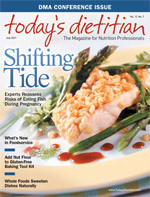 While the specifics may change from author to author, the messages are usually the same: Pregnant women should choose a variety of healthful foods to meet their increased nutrient needs; aim for steady, healthy weight gain within recommended ranges; and save a little room to indulge in those unique pregnancy cravings. Additionally, pregnant women are encouraged to keep their fish and seafood intake low due to worries over toxins (eg, mercury) that might be dangerous to the baby. When it comes to this latter recommendation, though, these books may be due for an update. But the 2010 Dietary Guidelines for Americans, the first set of national guidelines to be based on a detailed review of evidence, now recommend that pregnant and breast-feeding women include 8 to 12 oz of fish and seafood low in mercury as part of a healthful diet. Perhaps the primary reason to include fish and seafood products in the diet during pregnancy is that they are nutritional powerhouses. “Ounce for ounce, fish is generally lower in calories than other meats and contains higher concentrations of ‘healthy’ fats,” notes Judith Brown, PhD, author of several books on nutrition, including Nutrition Through the Life Cycle and What to Eat Before, During, and After Pregnancy. “Like other meats, fish are a good source of high-quality protein and a variety of minerals.” These properties make fish an excellent choice for pregnant women looking to keep weight gain within a healthy range while simultaneously meeting the body’s increased nutrient demands. More importantly, fish and seafood are the most plentiful dietary sources of healthful long-chain omega-3 polyunsaturated fatty acids (PUFAs), such as EPA and DHA.6 One of the main benefits of fatty fish consumption is that it supplies the DHA needed for a baby’s brain development, says Melinda Johnson, MS, RD, media spokesperson for the ADA and a lecturer at Arizona State University. She notes that babies need enough DHA for proper nervous system and eye development. “It is very difficult to find DHA in other food sources besides fatty fish,” she explains. A plethora of recent research, however, highlights the health benefits of consuming DHA, especially during pregnancy. As fish and seafood remain one of the best dietary sources, it is therefore more important than ever to educate women on the type and amount of fish and seafood that is safe for consumption during this time. “Safe fish and seafood for pregnant women are those that are high in EPA and DHA and low in mercury content. Fish such as shad, salmon, anchovies, herring, whitefish, mackerel, sardines, and flounder qualify as ‘safe.’ Shrimp, clams, and canned light tuna are also relatively good sources of EPA and DHA and are low in mercury content. Swordfish, king mackerel, tilefish, and shark tend to contain high amounts of mercury and should not be consumed by pregnant women,” says Brown. The FDA and ADA note that if local advisories determining the safety of fish in nearby lakes, rivers, and coastal areas are unavailable, then consuming up to 6 oz of fish per week from local waters (and no other fish) is considered safe for pregnant and breast-feeding women. Pregnant women must also handle fish and seafood properly to minimize the risk of food-borne illness. Until research conclusively demonstrates that raw or uncooked seafood consumption is safe and national guidelines are updated, women should still be cautious, following safe food-handling practices for fish and seafood. If women have lingering concerns about including fish and seafood in their diet during pregnancy, they can reap the health benefits of omega-3 fats in other ways. “Women can still consume the recommended 200 to 300 mg of DHA plus EPA daily by taking a third to a half teaspoon per day of fish oil or an algae oil supplement,” advises Brown. However, while these oils are often rich in DHA and EPA, they provide limited nutritional benefit beyond being a concentrated source of healthy fats, notes Brown, adding that women should be cautious of fish liver oils because they may contain excessively high amounts of the fat-soluble vitamins A and D.
Alternatively, as Johnson points out, pregnant women can “eat other food sources of omega-3 fatty acids, because your body can turn a small part of these fatty acids into DHA. These food sources include ground flaxseed and walnuts.” But the body is inefficient at this conversion, so consuming DHA and EPA directly is the most effective way to obtain their important health benefits. Johnson says women can look for fortified foods containing DHA, such as milk or eggs, or take a fish oil pill. Other food products are fortified as well, notes Brown. “Some margarines and beverages are fortified, but you have to check the product’s label to make sure the omega-3s added to the products are DHA and EPA and not alpha-linolenic acid,” she warns. This extra effort just may be a way to reel in some promising health benefits. The National Resources Defense Council has created a wallet guide containing a list of fish and their mercury levels so pregnant women can be informed about what they are consuming. Download it for free at www.nrdc.org/health/effects/mercury/walletcard.pdf. 1. Evans EC. The FDA recommendations on fish intake during pregnancy. J Obstet Gynecol Neonatal Nurs. 2002;31(6):715-720. 2. U.S. Department of Agriculture, U.S. Department of Health and Human Services. Dietary Guidelines for Americans, 2010. 7th ed. Washington, D.C.: U.S. Government Printing Office; 2010. Available at: http://www.cnpp.usda.gov/publications/dietaryguidelines/2010/policydoc/execsumm.pdf. Accessed April 26, 2011. 3. Kaiser L, Allen LH; American Dietetic Association. Position of the American Dietetic Association: Nutrition and lifestyle for a healthy pregnancy outcome. J Am Diet Assoc. 2008;108(3):553-561. 4. Oken E, Kleinman KP, Berland WE, Simon SR, Rich-Edwards JW, Gillman MW. Decline in fish consumption among pregnant women after a national mercury advisory. Obstet Gynecol. 2003;102(2):346-351. 5. Coletta JM, Bell SJ, Roman AS. Omega-3 fatty acids and pregnancy. Rev Obstet Gynecol. 2010;3(4):163-171. 6. Sontrop J, Campbell MK. Omega-3 polyunsaturated fatty acids and depression: A review of the evidence and a methodological critique. Prev Med. 2006;42(1):4-13. 7. Sontrop J, Avison WR, Evers SE, Speechley KN, Campbell MK. Depressive symptoms during pregnancy in relation to fish consumption and intake of n-3 polyunsaturated fatty acids. Paediatr Perinat Epidemiol. 2008;22(4):389-399. 8. Jans LA, Giltay EJ, Van der Does AJ. The efficacy of n-3 fatty acids DHA and EPA (fish oil) for perinatal depression. Br J Nutr. 2010;104(11):1577-1585. 9. Greenberg JA, Bell SJ, Ausdel WV. Omega-3 fatty acid supplementation during pregnancy. Rev Obstet Gynecol. 2008;1(4):162-169. 10. Guesnet P, Alessandri JM. Docosahexaenoic acid (DHA) and the developing central nervous system (CNS) — Implications for dietary recommendations. Biochimie. 2011;93(1):7-12.